Economists in Russia and the US agree the worst is over for Russian economy, with Bloomberg changing its tone praising it as an ‘underrated land of opportunity’. Experts agree President Putin’s economic team managed to turn around a pressing environment. Russia’s economy is recovering from last year’s panic following the slump in oil prices, according to experts. With the Russian Central Bank’s currency reserves increasing last week for the first time since July, and all of the major economic indicators improving, Western governments should be convinced that economic sanctions have no discernible effect, a Bloomberg View contributor, Leonid Bershidsky said in his article published on March 27. The managers of the Russian economy, especially at the Central Bank and the Finance Ministry managed to keep Russia’s economy open in a difficult environment, he said. “We see that the Government has strongly opposed the imposition of any restrictions on the free movement of capital, thus reaffirming the commitment to the course of economic openness,” Aleksandr Prosviryakov, Treasuries & Commodities Manager at PWC, told RT. Chief economist at BCS Financial Group, Vladimir Tikhomirov agreed, telling RT by phone that the government managed to keep the economy going despite all the risks, including currency risk. 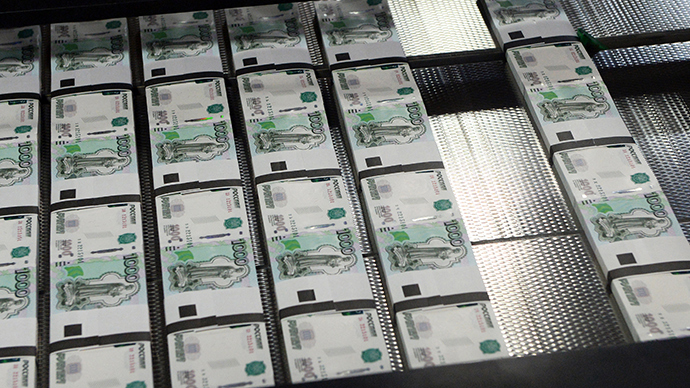 Russia held $131.8 billion of US debt in 2014, according to Bloomberg. While reserves as a whole dropped 23.9 percent in 2014, the holdings of US debt fell 37.6 percent, to $82.2 billion, as Russia started cutting its holdings of the US currency amid the sanctions standoff. The Russian ruble has been performing well lately; it gained 1.5 percent against the dollar last week in its best winning streak since mid-2013. Moreover, oil has played a much less prominent role in the ruble’s exchange rate in the first three months of 2015. Last year the ruble closely mirrored every action of oil prices - with the oil benchmark losing 50 percent of its value in the last 6 months of 2014, the ruble lost about 44 percent. Now the ruble is doing better than Brent crude. The Central Bank decided to start easing its benchmark interest rate, cutting the rate from 17 percent to 14 percent. This helped Russia to become an attractive carry trade destination, Bloomberg economists suggest. Russia is now one of the most attractive countries in terms of risk/return ratio, Prosviryakov said, adding that there was a significant inflow of foreign investment to the Russian market in the last few weeks. He believes the trend will continue. Global investors also appear to be optimistic about the future of Russian corporations as the country’s economic performance provides evidence to recovery. Around 78 percent of enterprises represented in the MICEX index showed a greater increase in sales than their counterparts around the world. The growth of quotations for the main Russian financial assets suggests that interest towards Russia is gaining momentum, including from international investors, according to Prosviryakov. Meanwhile, the Russian government’s forecasts point to a full-year contraction in gross domestic product of about 3 percent in 2015. Bloomberg economists expect a 4 percent drop, while Goldman Sachs predicts a decline of 2.7 percent. The Russian economy will shrink 3-4 percent according to Vladimir Tikhomirov’s forecasts. Russia remains a major market economy that cannot be “derailed by a few timid restrictions,” the Bloomberg analyst wrote in his article, adding that Russia has been named one of the top markets for equity performance this year, along with the US, China and India. Russian economists say Western sanctions had a double effect on the country’s economy. Restrictions imposed by some trading partners, on the one hand, hampered the business relationship between the companies in these countries with their Russian counterparts, but on the other hand, they have opened up new opportunities for friendly companies, Prosviryakov told RT. Meanwhile, Tikhomirov suggests that Russia’s food embargo also caused problems for the economy with the following wave of inflation. Russia has a lot of new business opportunities with different countries that are now mostly coming from Asia. Moscow and Beijing plan to extend their strategic partnership in finance, aviation and space, as well as improve trade and economic cooperation. The two countries decided to switch to local currencies in trading settlements and also to create a joint rating agency. Russia and China have been boosting cooperation in various fields, including the energy sector in which the countries signed a huge $400 billion gas deal. Moscow is also looking forward to trade in national currencies with Turkey. The countries are working on completion of the Turkish Stream pipeline which is to deliver 15.75 billion cubic meters (bcm) of gas to Turkey, and another potential 47 bcm to Europe via Greece. Next week Greek Prime Minister Alexis Tsipras is visiting Moscow to hold talks as Russia and Greece want to boost cooperation and strengthen ties.